Have you ever known a dog that wouldn’t eat anything you put near it’s mouth? It’s a rare dog indeed who is a food snob. Our beloved Happy Dawg is just such a rare creature. She won’t eat anything raw…it must all be cooked just so (even her yummy venison bones). Drop some ground meat on the floor, and it will sit there all night. This animal is the pickiest eater ever in canine history. Rick really wanted to find some treats for her so he could reward her when she does things like behave during a bath or track a deer. But we tried everything, and it was no go. 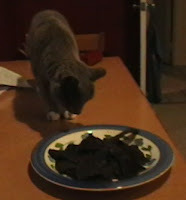 So, yesterday, he decided to make some liver jerky and see if that might make her salivate. Set aside the venison liver. Combine all other ingredients, stirring so that they dissovle. Add the liver and soak for five minutes. Remove liver, place on paper towels, and pat dry. Place the liver on dehydrator trays, or if youâ€™re using a conventional oven, on cookie sheets lined with wax paper. Dehydrate on lowest setting for 6 to 8 hours. (in the oven, put on lowest temperate and leave the oven door open a crackâ€¦you may have to play with the timing and temperature to figure out what works best.